Now that exams are over and you’re all fancying a break, why not let your hair down and help fight period poverty at the same time? 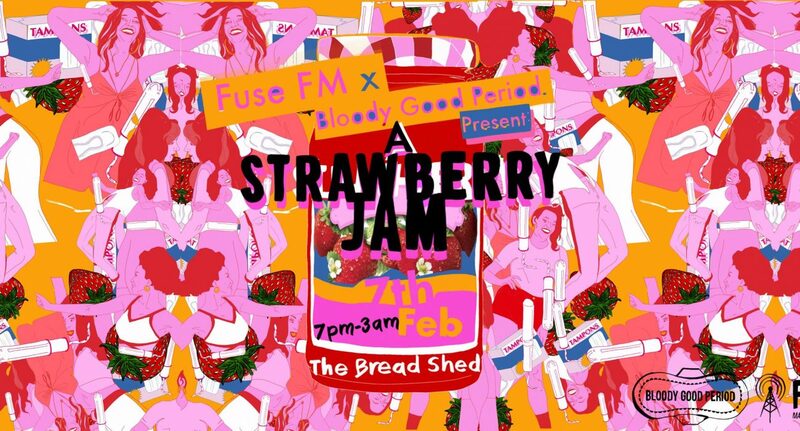 Fuse FM are back with yet another infamous club night, A Strawberry Jam, at The Bread Shed on the 7th of February. A Strawberry Jam is the most recent in a diverse line-up of sellout events hosted by Fuse FM in the past few months, which includes live gigs, club nights, and a night of comedy and sketches in collaboration with mental health charity C.A.L.M. This time, they’re bringing you an all-femme lineup, with a whole host of singers and DJs all night long. The night will begin with vocals from local talent before handing the dancefloor over to some of Manchester’s finest up-and-coming female DJs, as they take us on a journey from disco, through techno, and ending a little heavier with liquid DnB. Entry to the event is free, on one condition. Rather than donating money, Fuse FM asks that you bring items including unopened boxes of sanitary towels, tampons, shower cream, and toothbrushes. For a full list of items, check out the event page. If you’d prefer to donate money rather than sanitary products, entry is £4 on the door, with all proceeds going to Bloody Good Period. They’re a charitable project that provides period supplies and toiletries to asylum seekers, refugees, and those who can’t afford them. Through the generosity of members of the public, they collect donations of sanitary products and supply them to drop-in centres and support services across the UK. Martha Bolton, Fuse FM’s Head of Events, says that the event is an opportunity to give this generation of Manchester’s female DJs a platform to express their talent. Although the event itself is free, make sure you grab yourself a ticket off Skiddle to guarantee you entry. If you’d like any more information about the event, take a look at the event page on Facebook.